The Razer ManO’War gaming headset allows you to immerse yourself in the game completely. It offers you gaming grade 2.4 GHz wireless technology that guarantees you a lag-free experience. You can hear every detail and figure out every position of your opponent. The ear cups come with intuitive Quick Action controls that allow you to adjust the microphone and volume, thereby giving you full control over gameplay. You can also easily mute the sound without losing focus on the game, eliminating the need to engage the onscreen controls. The Razer ManO’War also has a Chroma lighting feature so that you can express your personality as you play. You are given a choice from 16.8 million colors, all of which are easily customizable using a pre-programmed palette of colors that you can easily set using Razer Synapse. The 50mm neodymium magnet drivers and immersive 7.1 surround sound ensure that you do not miss a single sound and know perfectly well from when and where your enemy is coming. A retractable digital microphone and Quick Action controls are included on the ear cup so that you never have to compromise gameplay. The battery is strong enough to give you 7 days of usage (based on two hours of usage per day) or 14 hours of uninterrupted gameplay without requiring a charge. Whether you want to engage in competitive multiplayer games or want to enjoy a solo gaming adventure, the ManO’War’s virtual 7.1-channel surround sound is very impressive no matter which game you want to try. The headset makes it easier for you to survive in games such as Overwatch, allowing you to easily pinpoint the directions of gunfire and enemy footsteps. It can prove just as handy in games such as Batman: Arkham Knight, allowing you to hear the tiniest of details such as raindrops and the fluttering of capes. With this level of sound, it becomes extremely satisfying to punch the bad guys – every crunching bone is amplified in glorious detail. 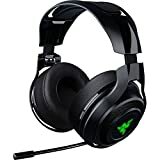 The Razer ManO’War is a highly impressive headset that offers great sound and performance and tons of wireless options and at the same time, it is very sturdy and durable. The only major drawback is the lack of wired audio, which means that it becomes difficult to use with mobile devices, but the battery life and signal are excellent, giving you a great deal of use.